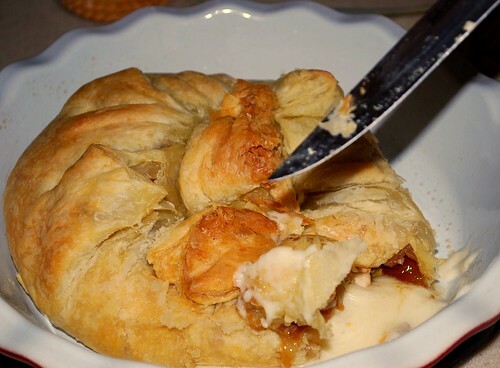 Here is another southern-inspired baked brie that we enjoyed over the holidays. This one is super simple, using peach preserves and chopped pecans as a filling. My brothers gobbled this one up so fast, they could barely eat any of their dinner! This photo aptly demonstrates why I always make baked brie in a nice pie dish! Remove puff pastry from freezer and allow to thaw. Preheat the oven to 400 degrees. Grease a pie dish and place the sheet of puff pastry on top. Slice brie horizontally. Place bottom half of brie in the middle of the puff pastry. Spread peach preserves over the brie. Sprinkle with nuts, then sprinkle with cinnamon. Place top half of brie over the filling. Fold corners of puff pastry over the top of the brie, gathering them together at the top in a decorative fashion. Brush beaten egg over the dough with a pastry brush to create a flaky, golden crust on the outside. Bake in preheated oven for about 15-20 minutes or until puff pastry is golden brown and cheese inside is melted. Serve hot with stoned wheat crackers, water crackers, apple slices, or pear slices. I make this all the time. It is so easy and everything tnhiks it is so fancy! One thing I do differently is cut the brie in half (so there is a top and a bottom) and spread the preserves in between. This allows the preserves to meld with the brie really well. Sometimes I trim some of the rind off and sometimes I don’t. It is great either way!